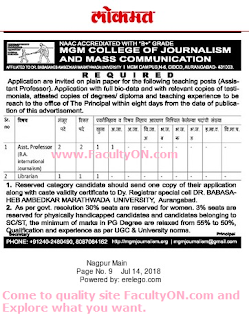 MGM College of Journalism and Mass Communication, Aurangabad has advertised in the LOKMAT newspaper for recruitment of Assistant Professor / Librarian jobs vacancies. Interested and eligible job aspirants are requested to apply within 08 days from 28th June 2018. Check out further more details below. 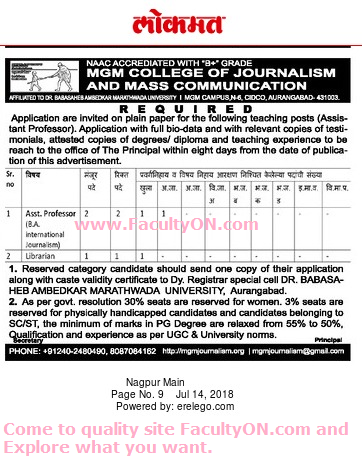 About College: Mahatma Gandhi Mission (MGM) Trust has been established in 1982 at Nanded (Maharashtra), which has its institutions at Nanded, Aurangabad, Navi Mumbai and Parbhani in Maharashtra State and at Noida in Uttar Pradesh (Delhi NCR). The aims and objectives of the trust are to contribute towards fulfillment of the task initiated by Mahatma Gandhi and based on its principle that, “Literacy Education is of no value if it is not able to build up sound character”.